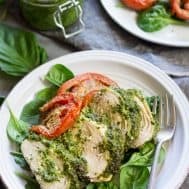 Super easy one-pan Paleo Pesto Baked Chicken that’s kid friendly, Whole30 friendly, healthy and seriously delicious! Ready in 30 minutes and perfect for weeknights. Little effort, big results. 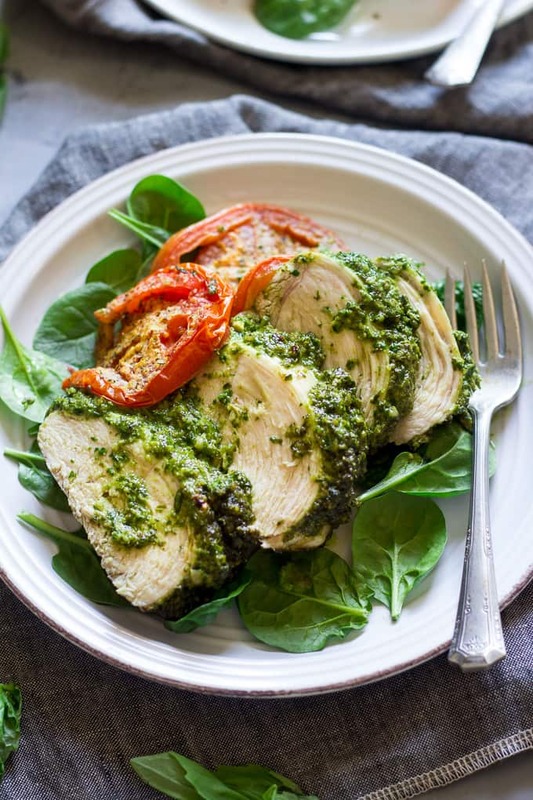 That about sums up this INSANELY delicious, easy Paleo Pesto Baked Chicken! Clearly, I’m on an easy meal kick lately – and I’m not about to stop anytime soon. I honestly have no clue why it took me so long to break out this old pesto recipe and give it new life. But now that I think of it, I’m sure the answer has something to do with the kids revolting against the GREEN appearance of the pesto when they were toddlers. 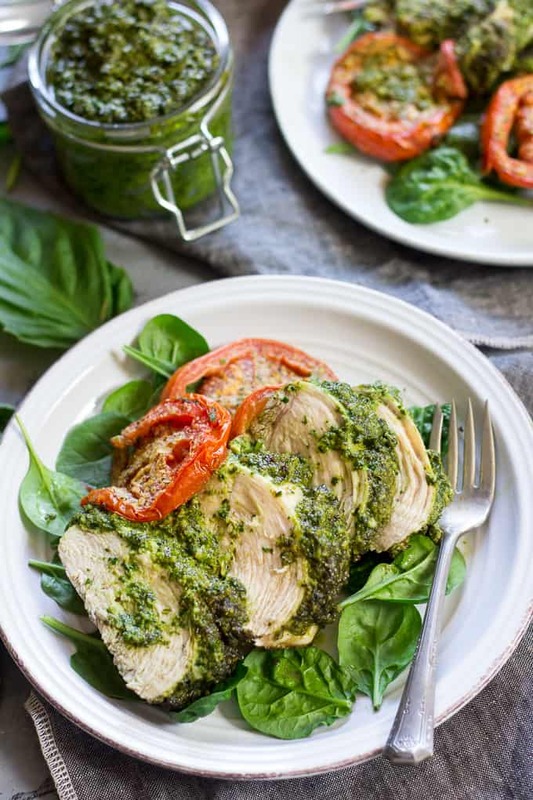 We must be making progress though, because each one of them LOVED the pesto and this recipe is now officially in our dinner rotation, along with our bacon wrapped chicken thighs, slow cooker BBQ chicken and meatballs. Lots of chicken happening lately, I must say! I took my old pesto recipe and revamped it a bit with the addition of baby spinach along with the basil, and nutritional yeast, which I’ve been quite the fan of lately. If you haven’t experimented with nutritional yeast, I highly recommend trying it out with eggs, roasted veggies, or the breakfast casserole I’ve been making lately. The pesto itself is incredibly easy to make – you just put all the ingredients into a high speed blender or food processor, turn it on, and let the pesto-magic happen. 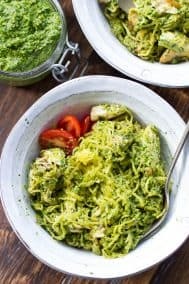 The recipe makes extra pesto to use in another recipe or just to enjoy with whatever you happen to be eating – I especially love it with eggs, potatoes, or as a topping with any of my favorite breakfast hash recipes. 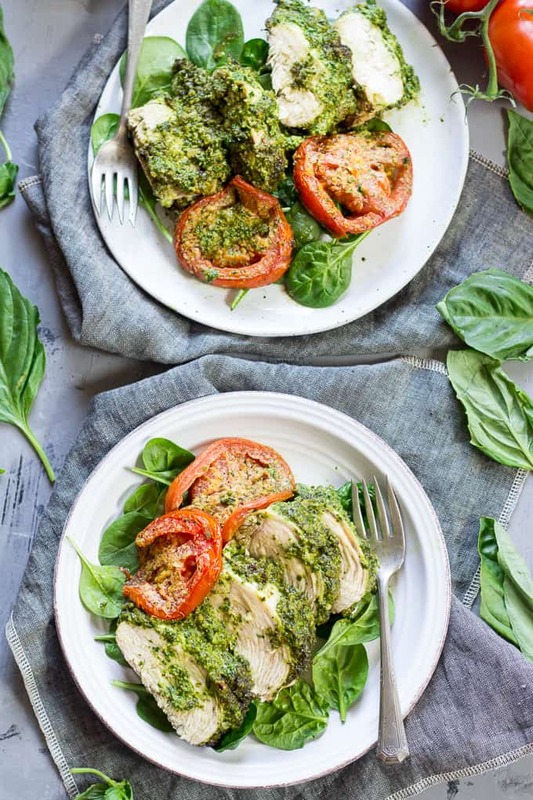 One you make the pesto, you simply top the chicken, layer on sliced tomatoes, sprinkle with a bit of additional spice and then bake for 25 minutes. 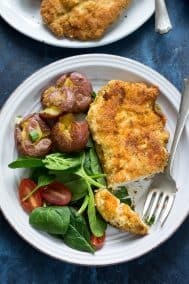 You can serve it over salad, with roasted veggies or potatoes – you absolutely can’t go wrong with this delicious, savory pesto baked chicken! 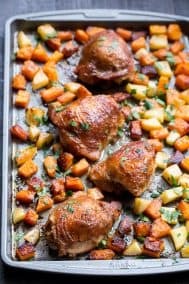 I’m all for easy one-pan, oven-baked recipes to make my weeknights easier! One more serious plus to this chicken is how well the leftovers keep. I actually made the chicken during the day and it stayed perfectly moist and full of flavor for hours, plus survived reheating of the leftovers for lunch the next day. I’m thanking the pesto – which is now in my fridge 24/7 because I’m just a little obsessed with it. 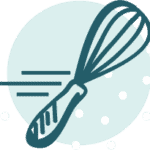 Hope you like it – let’s cook! 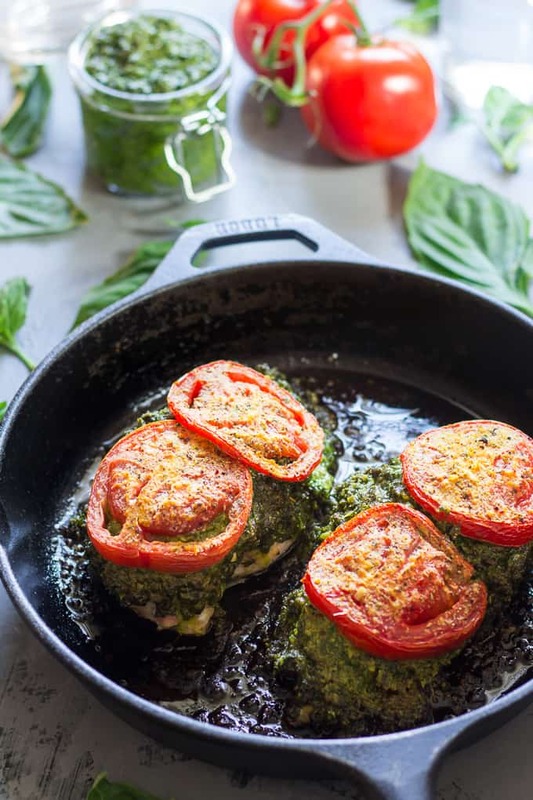 Easy one-pan Paleo Pesto Baked Chicken that's kid friendly, Whole30 friendly, perfect for weeknights and seriously delicious! 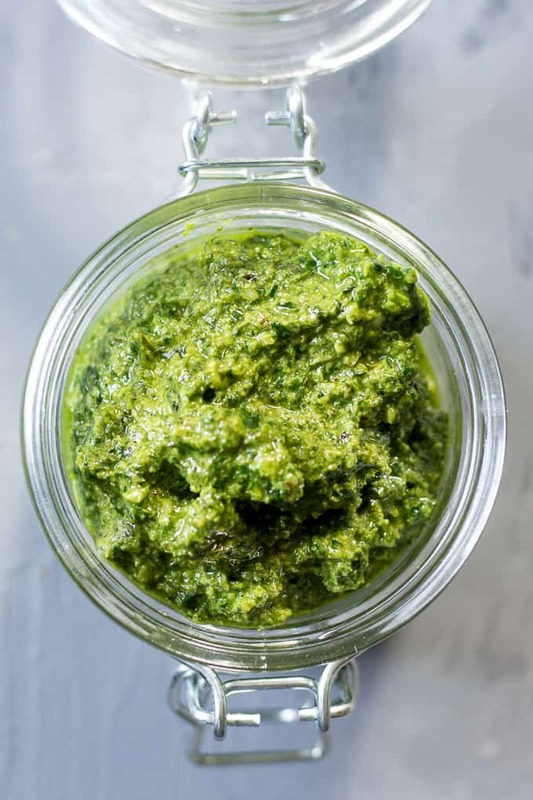 First, make the pesto while you preheat your oven to 400 F. You can also make the pesto the day before and store in the fridge to eliminate prep time. 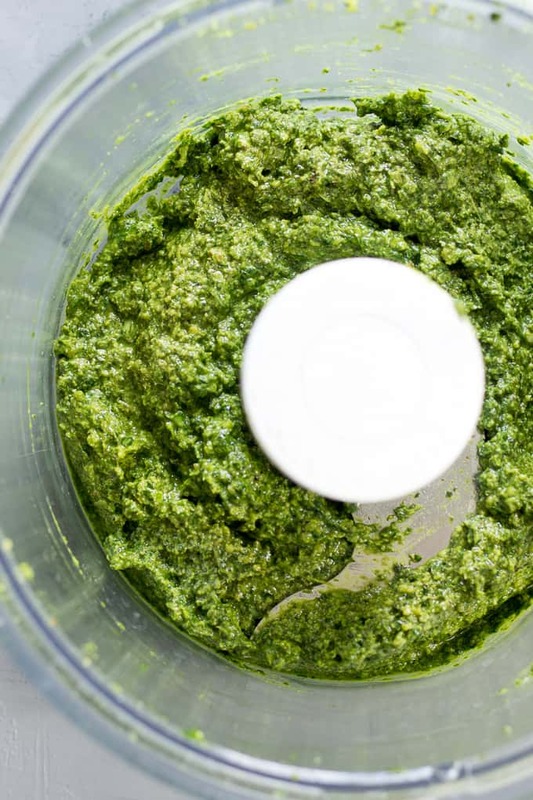 Add all of the pesto ingredients to a high speed blender or food processor (I used this one) and process/blend on high speed until a "paste" forms, stopping to scrape the sides and stir once or twice for even blending. Store the pesto in a covered container/jar in the refrigerator for up to one week. Place the chicken breasts in a well greased baking dish or cast iron skillet (I used this one) and sprinkle with salt and pepper. Then, generously spread the pesto all over the chicken (I went VERY generous!) and save the rest for another recipe. Top each piece of chicken with 2 tomato slices and a generous pinch of nutritional yeast** and Italian seasoning. Bake in the preheated 400 F oven for 25-30 minutes or until just cooked through. Slice chicken as desired and serve! Makes 4-6 servings. 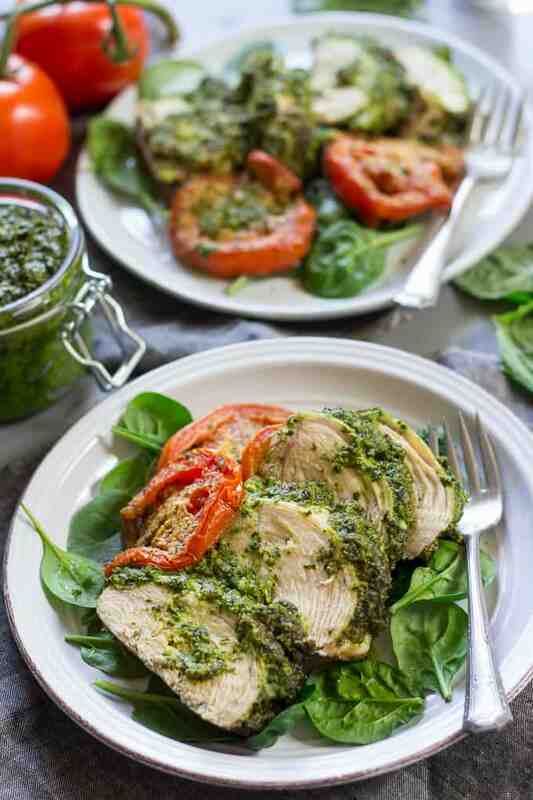 *This pesto recipe makes more than you'll need for the chicken. Store the remaining pesto in a lidded container in the refrigerator for up to one week. **You can omit, or you can replace with parmesan cheese if you are okay with dairy and are not completing a Whole30. Want more easy Paleo weeknight dinner recipes? Try one of these! How often do you make your own pesto? Have you experimented with nutritional yeast yet? I don’t think Ive ever made my own pesto but this looks like its definitely worth trying! Love an easy one-dish meal like this. I could definitely see myself making the pesto over the weekend to save time during the week. Totally worth trying for how easy it is, and the pesto itself goes with everything! Thanks for sharing! I have run into trouble finding nutritional yeast at the grocery store. How does it come out without using this ingredient? Thank you! I get nutritional yeast in the bulk section – if you have never cooked with it you really should try! It adds a rich, cheesy-like texture! So easy to make and very delicious! nothing regarding the baking but it adds a subtle “cheesy” flavor to the pesto! Made this for dinner for my mom the other night along with some roasted potatoes and a big salad and it was SO good!!! We both loved it, and she was surprised the Whole30 meal I made for her could be so delicious 🙂 love the pesto so much, and I’m glad I have a bunch extra. I added some lemon zest & juice to the pesto as well to give a little zip. 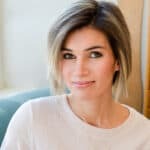 Thanks for the wonderful Whole30 recipes – you’ve been making Whole30 way easier for me! That’s awesome Rachel! So happy to hear that! I love having extra pesto leftover to put on everything 🙂 The lemon zest sounds delicious. We’re big fans of your recipes over here as well – my kids ask me to make everything they see of yours on Pinterest! This recipe is fabulous. Thank you very much for sharing it! I made it for a few friends the other night, and they loved it. The leftovers are great, too. I used pine nuts instead of walnuts because I prefer pine nut pesto. I cut the amount of garlic and spinach in half. I butterflied the chicken breasts to make them thinner. I baked the chicken at 400 degrees for 20 minutes, and it was very well done. Next time I’ll probably try baking the chicken for 15-18 minutes. This is the best pesto i have ever tasted!! 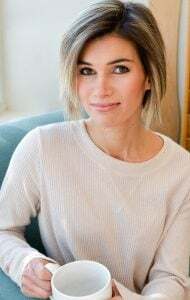 I made it for the spaghetti squash recipe and my husband and I loved it. He said “this is really good” more than once which is unusual lol AND then we used the left over for chicken breast and DELISH! Always going to have this in my fridge! Can I make it without nuts? My husband can’t eat them. I do believe you can, however I would add more basil and spinach to make up for some of the lack of bulk. Can’t wait to try this recipe. 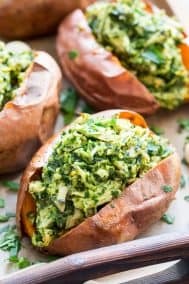 For the pesto, is there anything that I can substitute for the walnuts that is not nut based? Thanks! Hmm, not that I know of so I’m really not sure! Some people replace nuts with sunflower seeds…..
Great recipe!! It was a easy to make and is one of my new fave weeknight sauces! This was phenomenal! I like it even better than non-paleo pesto, honestly. It was really packed with flavor. I accidentally used chicken breasts vs. thighs so I had to add baking time but the tomato was a nice touch. On another note, the meatballs are going on the repeat dinner menu! My husband, who is not paleo, ate all of it. He even put them on a sandwich. Just perfect. Do not hesitate to make this because it is absolutely amazing. Thanks for sharing! Do you think almonds or cashews would work? I just found your site, and I love it! I made this yesterday, and it was a hit! Thank you for sharing. Does the pesto last longer than 1 week? I have a treenut/peanut allergy. I cook with sunflower seeds a lot. Do you think I could substitute them for the walnuts? I think it’s worth a shot, not sure about the consistency though! Anyone else have trouble blending the pesto? I tried my ninja food processor…cuisinart smart power blender..and another large blender and have had zero luck. I guess this means i wasted all of this food. 🙁 I really wanted to try this with the squash pasta recipe. Add more oil 1TBLSP. At a time or can also try adding a bit of water or a combo of the two to loosen things up in the blender/food processor. So fantastic! 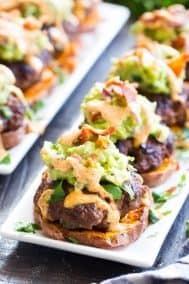 Another great recipe from paleo running momma – you never disappoint. 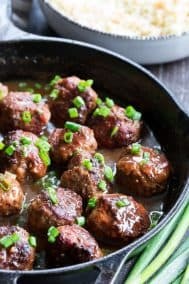 I’ve made several of your recipes doing Whole30 and they’ve been my favorites.. Followed the recipe exactly, served over spaghetti squash and topped with crumbled bacon and a drizzle of balsamic. So good!! Your pesto recipe is BOMB. So I did go through with making the whole recipe, but if I had stopped at the pesto, that would’ve been just fine because the fresh PESTO IS AMAZING. I am going to stop at the store to get more ingredients for it. PS. the amount of pesto specified is enough for 3-3.5 pounds of chicken. I also put some white wine and water in the baking dish and covered it to keep it moist. WOW! 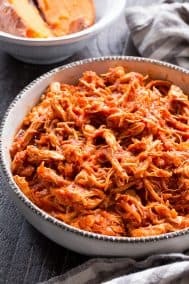 This recipe is amazing! It’s hard for me to find gluten and dairy free meals for my boyfriend. I followed the recipe completely, and it turned out fantastic!